WATERFORD – Keith Rocco has run out of championship fingers at the New London-Waterford Speedbowl. Rocco came out on top of a late race shootout with Jason Palmer to win the 30-lap Late Model feature Saturday at the Bemers Big Show at the New London-Waterford Speedbowl. Victory lane also proved to be the site for Rocco to celebrate his third Late Model division championship for Rocco. Palmer, of Berlin, was second and Ray Christian III of Uncasville third. 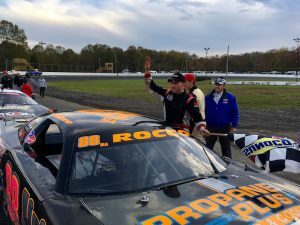 Rocco was far enough ahead in the standings coming into the day that he clinched his third Late Model title in the last four years by simply taking the green flag for the event. It marked Rocco’s 10th championship overall at the Speedbowl, a track where he is the all-time winningest driver. Rocco celebrated his sixth SK Modified division title at the track in that division’s final event Sunday. He also has a Limited Sportsman division title. He won his first two Late Model division titles driving for car owner Scott Fearn. Saturday’s marked his first driving for car owners Mike and Beth Sullivan. And there was no waltzing to the title for Rocco Saturday. Rocco went by Christian for the lead three laps into the event. With 13 laps remaining Palmer moved past Christian into second place. On a restart with three laps remaining Palmer stayed to Rocco’s outside and led by inches at the white flag, but the caution came back out again before the checkered. On the first attempt at a green-white-checkered finish it was Rocco holding the spot before the caution flew once again just after the white flag. Rocco chose to restart on the outside on the final restart and was able to hold off Palmer’s charges on the final dash to the finish. Great side by side for end with Palmer . Fun to watch…..